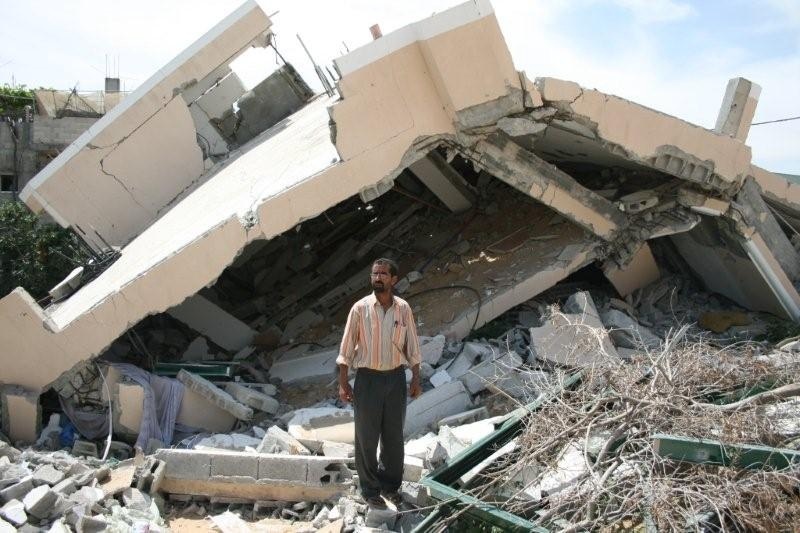 Civil society across the Middle East and North Africa (MENA) region is now more capable to use international standards to solve local problems related to land and natural resource management. An indicator of this progress is the recent Land Forum held in Tunis from 25 to 27 October 2017. The sixth session of the Land Forum in MENA was the most-recent iteration of the regional forum for the exchange of experiences and strategies and the enhancement of communication among civil society organizations concerned with land issues and related challenges. 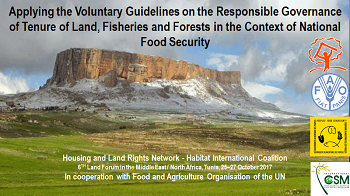 Habitat International Coalition’s Housing and Land Rights Network organized the gathering in collaboration with the Food and Agriculture Organisation of the UN (FAO) to apply “The Voluntary Guidelines on the Responsible Governance of Tenure of Land, Fisheries and Forests in the Context of National Food Security” (VGGT), which the Committee on World Food Security adopted in 2012. The goals of this Forum were to determine, priorities, challenges and policy shortcomings of the region, as well to fill any gaps in the VGGT in that context. In doing so, the workshop sought to promote the human rights approaches to land and natural resource management issues in light of the rapid and violent developments affecting the rights of peoples to exercise sovereignty over their natural resources within the State and, at the same time, to clarify the individual, collective, domestic and external human right obligations of States. The workshop brought together 27 participants from 10 countries from across the region representing various civil society organizations concerned with the monitoring and control of land and natural resource issues and associated related issues such as agroecology, support for small-scale food producers and small family farms. The workshop addressed an important set of issues related to the diagnosis of the issues in the region and the mandatory aspects of the VGGT in certain cases. It prioritized the strategy for achieving food sovereignty, clarified the definition of related terms and concepts, reviewed the dilemmas and challenges of tenure governance, assessed the need for mechanisms to implement and monitor the VGGT, identified omissions and shortcomings and urgent remedial steps, and linked these with operations global and regional levels. The discussion sessions of the workshop raised several controversial issues that still need to be further understood by civil society organizations in the region, the most important of which are landless groups and their rights in the light of tenure governance; the definition of tenure and its multiple forms, both formal and informal; the definition of the State and rights and responsibilities to manage its territory, spatial planning and justice in the context of tenure governance, the definition, usage and rights related to the concept “indigenous peoples” in the region; chronic issues of responsible governance of tenure in our region, such as gender inequality and discrimination; the effects of climate change; protracted crises caused by conflict, occupation and civil war; and the consequent cases of displacement and eviction of thousands of families in search of a safe haven within and outside of this region. 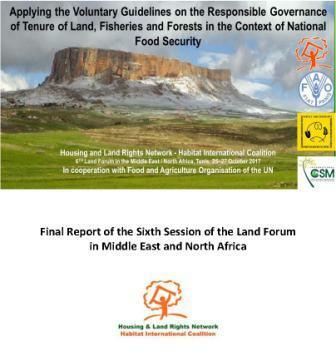 This Land Forum combined a learning process with an exercise to determine what is missing in the VGGT and their implementation in MENA, as well as set out a program of urgent future action.